replication of DNA with completion of mitosis but no cytokinesis. Polyploidy: the replicated chromosomes retain their individual identity. Polyteny: the replicated chromosomes remain in precise alignment forming "giant" chromosomes. Cells are polyploid if they contain more than two haploid (n) sets of chromosomes; that is, their chromosome number is some multiple of n greater than the 2n content of diploid cells. For example, triploid (3n) and tetraploid cell (4n) cells are polyploid. megakaryocytes; Megakaryocytes, from which platelets are made, may pass through as many as seven S phases producing a giant cell with a single nucleus containing 128n chromosomes. Its fragmentation yields platelets. giant trophoblast cells in the placenta. Polyploidy is very common in plants. Further details of polyploidy — including its role in speciation — are available on a separate page. Link to it. The most thoroughly-studied examples of polyteny are the giant chromosomes found in certain cells of larval flies. 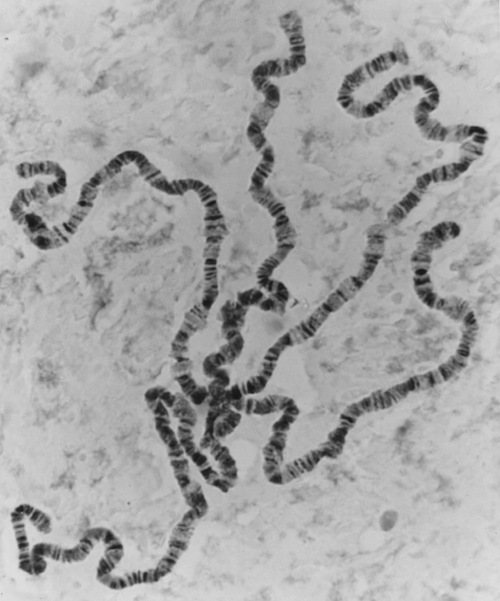 The photomicrograph (courtesy of B. P. Kaufmann) shows the polytene chromosomes in a salivary gland cell of a Drosophila melanogaster larva. Such chromosomes are found in other large, active cells as well. Each of Drosophila's 4 pairs of chromosomes has undergone 10 rounds of DNA replication. The maternal and paternal homologs — as well as all their duplicates — are aligned in exact register with each other. So each chromosome consists of a cable containing 2048 identical strands of DNA. These are so large that they can be seen during interphase; even with a low-power light microscope. What is the function of polyteny? The probable answer: gene amplification. Having multiple copies of genes permits a high level of gene expression; that is, abundant transcription and translation to produce the gene products. This would account for polyteny being associated with large, metabolically active cells (like salivary glands). Polytene chromosomes are subdivided into some 5,000 dense bands separated by light interbands. gray bands of euchromatin where the DNA is more loosely compacted and there is active gene transcription. The interbands contain regulatory elements — promoters and enhancers — that control the genes in the adjacent gray bands. Polytene chromosomes also have regions — called "puffs" — that are swollen and appear to have a looser structure. differs with changing conditions in one type of cell. For example, giving the molting hormone ecdysone to an insect causes a predictable change in the puffing pattern. This is just what one would predict if the puffs represent regions of intense gene transcription. 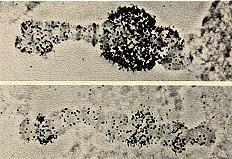 Top: the autoradiograph shows the puff in chromosome IV of the tiny fly Chironomus tentans after giving ecdysone and radioactive uridine (an RNA precursor). The grains clustered over the puff show that it is a site of intense RNA synthesis. The pattern of puffing within a cell varies over time. For example, each time an insect larva prepares to molt, a definite, predictable sequence of puffing occurs. These eight photomicrographs (courtesy of Dr. Michael Ashburner, University of Cambridge) show the changes in the puffing pattern of equivalent segments of chromosome 3 in Drosophila melanogaster over the course of some 20 hours of normal development. Note that during this period, when the larvae were preparing to pupate, certain puffs formed, regressed, and formed again. However, the order in which they did often differed. For example, in the larva, band 62E becomes active before 63E (c, d, and e), but when pupation begins, the reverse is true (g, h). In general, early puffs reflect the activation of genes encoding transcription factors. These proteins then bind to the promoters of other genes, turning them on and causing a puff to appear at their loci.